Fishing boats tie up along the wharf at Covehead Bay in Prince Edward Island with buildings that stretch along the waterfront. In one of these buildings you can enjoy a meal at a quaint and cozy restaurant with a choice of eating on the outside deck or inside. After your meal, you can stroll along the boardwalk at Covehead Bay and enjoy the beautiful scenery overlooking the Gulf of St. Lawrence. Covehead Wharf, Covehead Bay, Gulf of St Lawrence, Highway 6, Blue Heron Coastal Drive, Queens, Prince Edward Island, Canada. 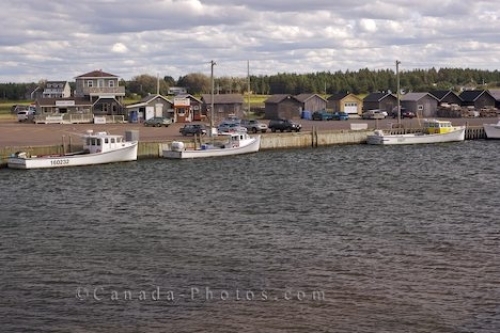 Picture of the wharf in Covehead Bay that overlooks the Gulf of St. Lawrence in Prince Edward Island, Canada.